Staying home and blowing out 100 candles wasn’t the way Polito “Paul” Olivas wanted to spend his milestone birthday. Instead, the 30-year Army veteran who jumped into Normandy on D-Day in 1944 with the 101st Airborne Division decided to take another leap. 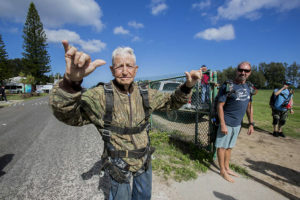 On August 22, Olivas, a former Green Beret, jumped tandem from a plane 14,000 feet in the air over Oahu’s North Shore and landed in Dillingham Airfield – a week after his actual birthday. Although Olivas has hundreds of parachute drops under his belt, none of them included freefalling — the span in jumping before the chute opens. His previous jumps were all relatively low to the ground, and the parachutes were connected to a static line that automatically unfurled them as he exited the airplane bay door. And he just might — for his 101st birthday, which he’s already pledged to do. Even at 100, Olivas doesn’t use glasses or a hearing aid, friends say. Before the jump, the 5-foot-2, 120-pound Olivas said he was ready. Not one to sit around and grow old, Olivas is widely known for restoring classic Mustangs and is a founder of the Aloha Mustang and Shelby Club of Hawaii. He still drives a fire-engine red 1964-1/2 Mustang. “He’s been wanting to do this for some time, but his wife, when she was still living, wasn’t too fond of the idea,” said neighbor Boxley Diggs “So he held off at her request.” Olivas lost his wife of nearly 56 years, Magdalena, in May.